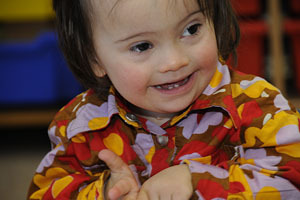 People with Down syndrome also experience learning difficulties that lead to delays in many areas of development. However, not all areas of development are affected equally - there are particular patterns of learning difficulties. These patterns can inform more effective teaching approaches and therapies. Children with Down syndrome usually learn and progress more slowly than most other children. However, not all areas of development are equally affected. There is a specific pattern of cognitive and behavioural features that are observed among children with Down syndrome that differs from that seen in typically developing children and children with other causes of intellectual disability. We refer to this pattern of characteristic strengths and weaknesses as a 'developmental profile'. By understanding how development and learning differs for children with Down syndrome we can devise more effective teaching approaches and therapies. The social functioning of babies and children with Down syndrome is relatively less delayed than other areas of development. Babies with Down syndrome look at faces and smile only a week or two later than other children and they are usually sociable infants. Infants with Down syndrome enjoy communicating and make good use of non-verbal skills including babbling and gesture in social situations. Most children and adults with Down syndrome continue to develop good social skills and appropriate social behaviour, though a significant minority may develop difficult behaviours, particularly those with the greatest delays in speech and language development. Research suggests that people with Down syndrome learn better when they can see things illustrated. This finding has been demonstrated across a number of areas of development including the acquisition of language, motor skills and literacy. This suggests that teaching will be more effective when information is presented with the support of pictures, gestures or objects. Many children with Down syndrome can develop reading abilities in advance of what might be expected for their cognitive and language levels. Reading makes an important contribution to vocabulary and language development for all children and this may be a particular benefit for children with Down syndrome, given their specific language delays. 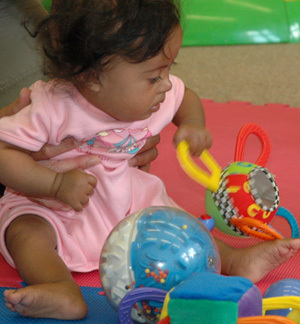 Motor skills develop at a slower rate for children with Down syndrome than for those without. These delays in motor development reduce infants' opportunities for exploring and learning about the world around them and therefore further affect cognitive development. Poor oral motor control may impact the development of language skills. Children with Down syndrome show specific delays in learning to use spoken language relative to their non-verbal understanding. Almost every child will have expressive language that is delayed relative to their language comprehension. The children experience two types of expressive difficulty - delay in mastering sentence structures and grammar, and specific difficulties in developing clear speech production. The gap between the children's understanding and their ability to express themselves is a cause of much frustration and can sometimes lead to behaviour problems. It can also result in the children's cognitive abilities being underestimated. Language delay also leads to cognitive delay as much human learning is through language and language is internalised for thinking, remembering and self-organisation. Short-term memory is the immediate memory system which holds information 'in mind' for short periods of time and supports all learning and cognitive activity. It has separate components specialised for processing visual or verbal information. The ability of children with Down syndrome to hold and process verbal information is not as good as their ability to hold and process visual information. These verbal short-term memory problems make it more difficult to learn new words and sentences. They also make it more difficult to process spoken language and this can adversely affect learning in the classroom. Studies suggest that the processing and recall of spoken information is improved when it is supported by relevant picture material. This information has led to educators stressing the importance of using visual supports including pictures, signs and print when teaching children with Down syndrome as this approach makes full use of their stronger visual memory skills.